Why Do We Sometimes See a Ring Around the Moon? Have you ever looked up on a clear night and noticed there’s a complete ring around the Moon? In fact, if you look closely, the ring can have a rainbow appearance, with bright spots on either side, or above and below. What’s going on with the Moon and the atmosphere to cause this effect? 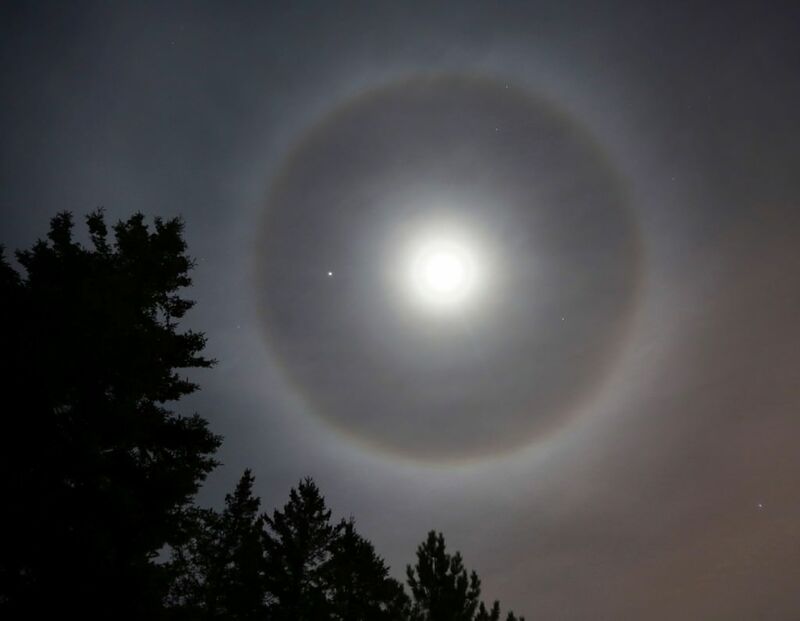 This ring surrounding the Moon is caused by the refraction of Moonlight (which is really reflected sunlight, of course) through ice crystals suspended in the upper atmosphere between 5-10 km in altitude. It doesn’t have to be winter, since the cold temperatures at high altitudes are below freezing any time of the year. Generally they’re seen with cirrus clouds; the thin, wispy clouds at high altitude. The ice crystals themselves have a very consistent hexagonal shape, which means that any light passing through them will always refract light – or bend – at the same angle. Path of rays in a hexagonal prism” by donalbein – Own work. Licensed under CC BY-SA 2.5 via Commons. Moonlight passes through one facet of the ice crystal, and is then refracted back out at exactly the angle of 22-degrees. Of course, the atmosphere is filled with an incomprehensible number of crystals, all refracting moonlight off in different directions. But at any moment, a huge number happen to be in just the right position to be refracting light towards your eyes. You just aren’t in a position to see all the other refracted light. In fact, everyone sees their own private halo, because you’re only seeing the crystals that happen to be aligning the light for your specific location. Someone a few meters beside you is seeing their own private version of the halo – just like a rainbow. The size of the ring is most commonly 22-degrees. This is about the same size as your open hand on your outstretched arm. The Moon itself, for comparison, is the size of your smallest nail when you hold out your hand. The 22-degree size corresponds to the refraction angle of moonlight. We see a rainbow because the different colors are refracted at slightly different angles. This is exactly what happens with a rainbow. The moonlight is broken up into its separate colors because they all refract at different angles, and so you see the colors split up like a rainbow. Lunar halo with rainbow. Photo credit: Gustav Sanchez. Moon dogs (or “mock moons”) are seen as bright spots that can appear on either side of the Moon, when the Moon is closer to the horizon, and at its fullest. These are located on either side of the lunar ring, parallel to the horizon. In certain conditions, especially in the Arctic, where the ice crystals can be close to the surface, you can get a moon pillar. The light from the Moon reflects off the ice crystals near the surface, creating a glow near the horizon. This is a Sun pillar (not a moon pillar), but it’s the same general idea. Photo credit: Mary Spicer. Want to see more? Here’s a great lunar halo photo from NASA’s APOD. And here’s more info from Earth and Sky.